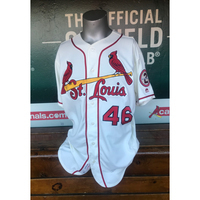 Game worn Francisco Pena Saturday Alternate Ivory Jersey from September 22nd, 2018 when the Cardinals beat the Giants 5-4. During the 2018 season Pena would bat .203, with 8 RBI's and 2 Homeruns. 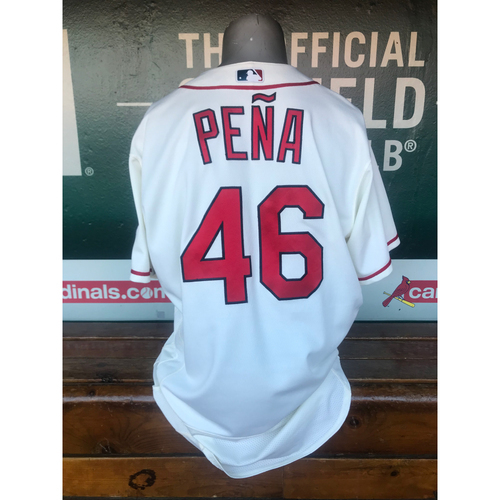 Pena jersey size is 48. This product is officially licensed and authenticated by Major League Baseball. By placing a bid on this item, you are expressly acknowledging the following conditions of this auction: All items are sold "as is". All sales are final. No refunds, returns, or exchanges. Each piece of Cardinals Authentics memorabilia includes a hologram signifying its authentication by Major League Baseball. All items will require a signature upon delivery, if you would like this removed please email Erik Jaffry ejaffry@cardinals.com when the auction has been completed. If you have any questions about this item, please contact ejaffry@cardinals.com before bidding or by calling 314-345-9667 before bidding.